Long before there was a Walgreens on every street corner, there were all sorts of ma & pa pharmacies in the Chicago area where I grew up. These places were amazing. Imagine a smaller version of Walgreens, less sterile, more character and a walk-in humidor. The pharmacy by my house had an entire aisle dedicated to sports cards, non-sports cards and candy. The floor was carpeted, the air smelled like bubble gum, it was heaven. I was in there regularly in my early years. Any time I could rustle a dime or a quarter away from my folks, I bought all sorts of non-sports cards. My neighbor Julie Foster and I collected Wacky Packages. In early spring 1975, I was 8 years old. One day I was digging through a box of Wackys at the pharmacy when some older guys started giving me a hard time and laughing at my stickers. They bought baseball cards. I put down the Wackys and bought baseball cards too. I've been hooked ever since. From 1975 through 1978, I was at the pharmacy buying baseball cards or trading with my friends. In the summer of 1979, I was at the Sunday flea market at the now defunct Twin Drive-in Movie Theater in Wheeling, Illinois, where I found an old man selling baseball cards from the 1950s. He was selling 1955 Topps singles for 50 cents each. I ran and found my pop and begged him to buy me some of these old cards. Unfortunately, my dad is a child of the Depression and he haggles over the price of the daily newspaper. So getting 50 cents out him is nearly impossible. Dad argued with the old man to sell him cards for a quarter each. The old man wouldn't budge, 50 cents or nothing. My dad bought me two cards. He then argued with the old man to give me a plastic sheet to put the cards in. I then devised a plan to get more old cards. At age 13, I got a job as a janitor at Dacoma Day Camp in Northbrook, Illinois. I was paid $1.25 an hour. Each paycheck went to cards and tropical fish (I somehow got hooked on tropical fish and had four fish tanks filled with guppies). Back at the flea market, I regularly bought 1955 Topps from the old man. I found several others selling cards and took in quite a haul each Sunday. The old man introduced me to Sports Collectors Digest (SCD) and I quickly subscribed. SCD was filled with stories about old and new cards. It also had tons of national advertisers and a thick classified section. I bought cards, programs, ticket stubs, and team schedules from guys across the country. I also found an advertisement for a baseball card shop located on the southwest side of Chicago. I begged my pop to take me there. This was the only baseball card shop in the Chicago area at the time and it was a long drive away from the north suburbs where I lived. My dad finally relented and one Saturday morning we trekked from Dundee Road to South Archer Avenue. The owners of the shop were school teachers, I believe, and did cards in their spare time. They patiently went through my list of cards but didn't have any of them in stock. So they brought out some cards they thought I might like. I picked out a 1958 Topps Hank Aaron. I can't remember the price but to my surprise, my dad bought the card for me. Unfortunately, for the last 36 years he has been regularly reminding me how he drove hours across the city to buy me that "expensive" Aaron card. I'm guessing he paid 20 bucks for it. In SCD, I found ads for local card shows and started to attend those regularly. Soon I was setting up at the flea market selling cards. I bought and sold cards heavily from 1980 to 1982. I also amassed a nice autograph collection. From 1983 to 1985, it was high school and I was too cool for cards. From 1986 to 1990, I was in college and spending the few bucks I had on beer rather than cards -- though I still dabbled. After college, I got back into cards heavily from 1991 to 1993. At this time there were 5 to 10 card shows a week in the Chicago area. I was regularly setting up at shows in the city and north suburbs. From 1994 to 2001, I ran a publishing company and only had time to dabble in cards. In 2002, I entered law school and got back into cards big time. Thanks to the internet, eBay especially, I have been buying and selling cards every day since '02. Anyway, about three years ago, I started venturing out to other locales in the Midwest. I have now set up in Madison, Wisconsin; Highland, Fort Wayne and Indianapolis in Indiana; Holland, Grand Rapids and Jackson in Michigan; St. Louis, Missouri; and Dayton, Cincinnati, and Canton in Ohio. I plan on hitting more new places soon. I am just having a great time! At the shows, people always ask me what I collect. I used to collect vintage stars like Aaron, Mantle, Mays, Banks and Clemente. When I was in law school, I had to sell my collection to pay for books. Though by the end of law school, I was investing a portion of my student loan money to purchase cards then sell them on eBay to offset law school expenses. I've owned just about every baseball card from 1948 to 1979 at some point. I recently got back into collecting vintage autographs. I prefer autos on picture postcards but have been buying larger pictures lately. I like to have the auto on a picture of the player I haven't seen before. I've picked up some real gems lately and am very excited about my autograph collection. For cards, I consider my collection to be whatever I currently have in stock. These days, I prefer cards that pre-date World War II. These are harder to come by and more interesting to me than the post-war Topps cards. I am always looking to buy collections. Feel free to contact me with cards to sell, or with comments about this website. I love to talk about cards. 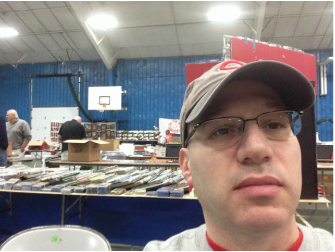 Come find me at a local card show on any weekend. To find my current show schedule, click the "Card Show" tab up top. Also, check out my eBay auctions. I have dozens of auctions on eBay most every night. My eBay ID is tabithagordon. I also plan on posting more cards for sale on this website -- click HERE for Fat Daddy's Baseball Card Shop. I also must mention that I have been a licensed attorney in Illinois for about 10 years now and recently opened up my own practice. I can provide affordable legal services in just about any area of law. Check out my website www.abgillinois.com for more information on my legal services. I really appreciate your visit to www.fatdaddyssports.com and that you took the time to read my little tale. Happy collecting!